Absolutely crazy weather. Approaching 30 degrees C. The Brno Dam was packed with people. In 2017, this race was canceled because of hard wind. This year, the only trick that our lake did was to swap wind direction specially for Saturday. The entire week had been a nice tailwind from Start to Finish. Now it was a headwind. Otherwise the water was fine. I had to be there because of the eights races. I didn’t race any small boats. But lots of family members were racing. Here’s a picture I took when I walked to a nearby restaurant to have a quick lunch. I spent most of the day relaxing on the grass. I made a mistake not going for a quick training row in the single, but there was so much to see. 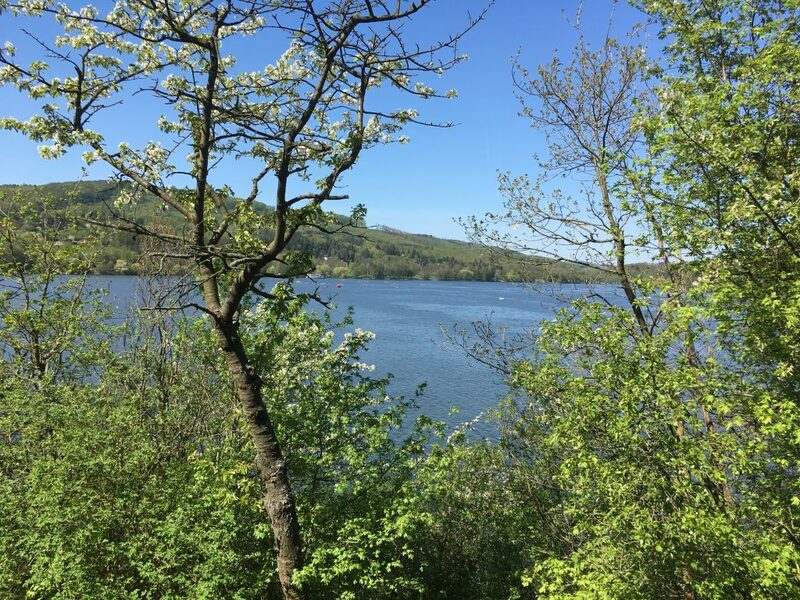 These races are organized by Lodni Sporty, the rowing club on the other side of the lake. From our club’s perspective, it’s a strange event. You don’t really see the buzz of racing, the commentator’s voice, the out-of-town clubs arriving with their trailers. It’s just a busy, sunny day at the rowing club. 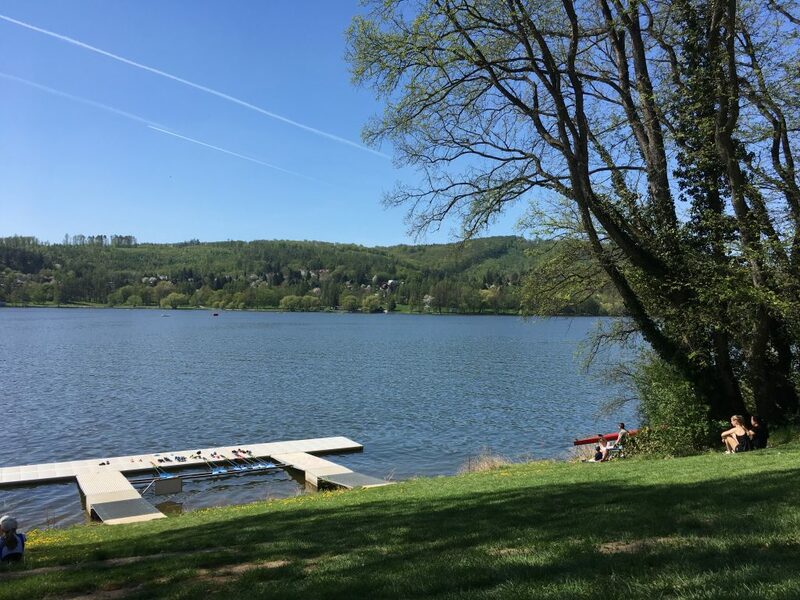 But then you take your boat out of the boathouse on to the water, you do a warming up, and there you are in the middle of a regatta. 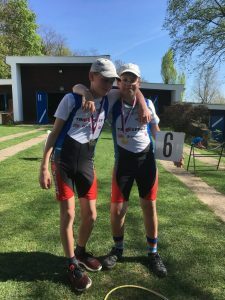 Dominik was second in the 4x+ over 1000m. 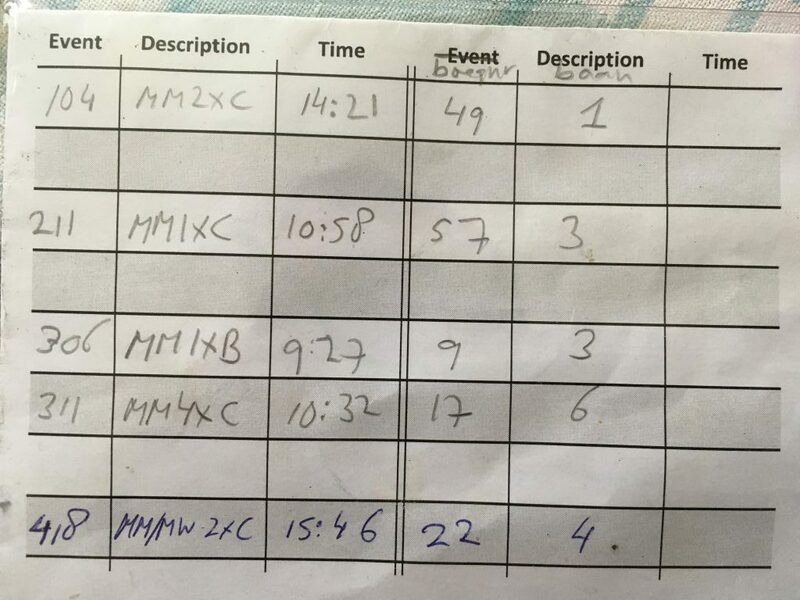 In fact, their cox had a confusing moment and they rowed about 1100m, leaving the race course and then returning to it. 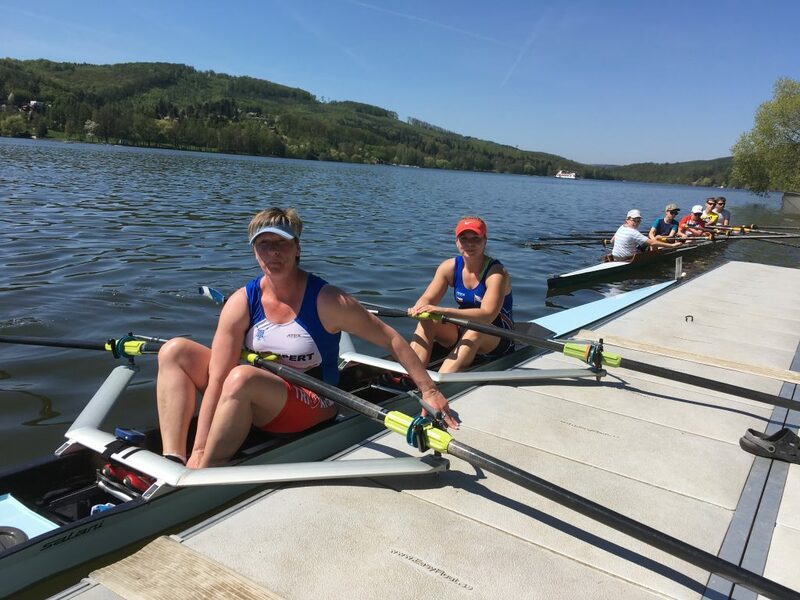 Romana and Veronika won the Women’s double (for their only opponent not being at the start in time, because of double boat use). We need binoculars to see most of the racing. By then, it was time for some eights racing. 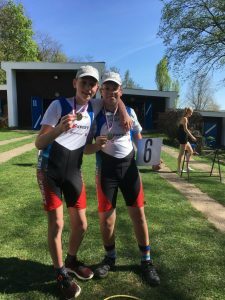 A certain Masters group had registered for the Open 8+, and a mix of Juniors and Men from our club had taken up the challenge. 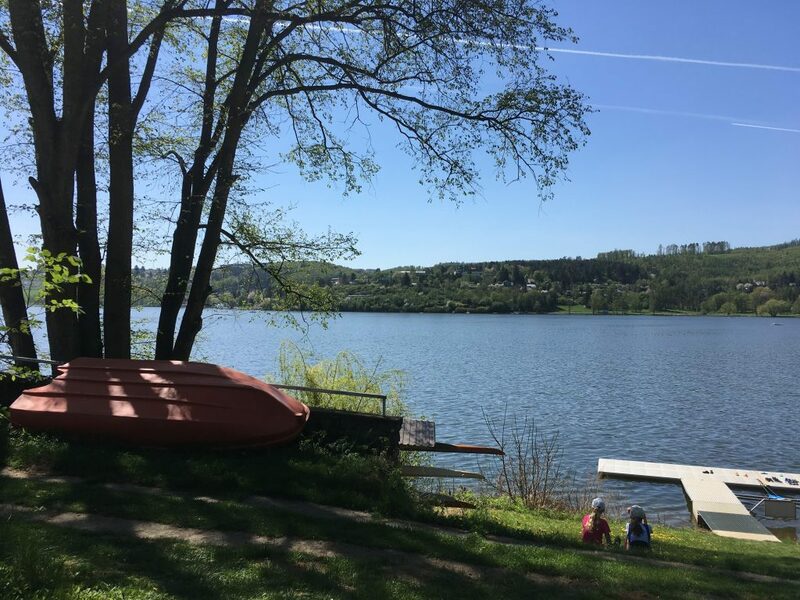 So a little after 5pm, after the Women’s 8+ race, two crews hopped in the boats and rowed to the start, which is just one kilometer from our club. 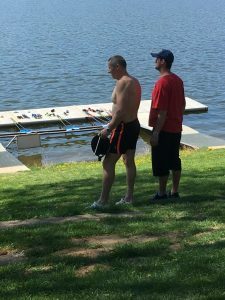 This Masters 8+ group needed that entire 1k to go from arms only to full stroke, and that was all the warming up they got, because the referees were eager to get this final event of the regatta started off. Two eights at the start. A Masters group, and a mix of Juniors and young Men. A Wintech boat (the Masters) against an Empacher (the men/juniors). No practice starts done at all, and still this was a great start. 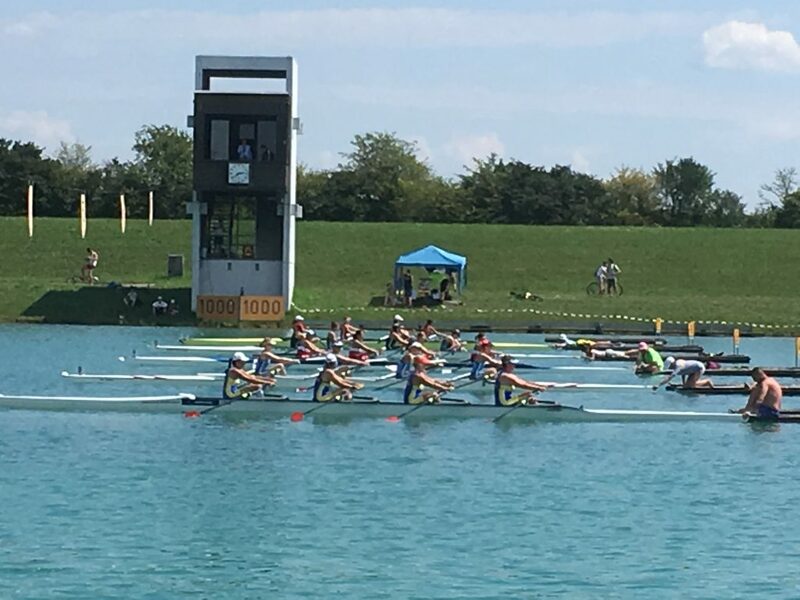 The Masters were half a length ahead of the juniors/men and in the first 200m they built that to a boat length advantage, going strong at 35spm. One of the Masters rowers, a guy sitting in 2 seat, was rowing well and enjoying a bit of racing, but also struggling with his too loose hat blowing off his head in the headwind. The hat blew into his lap and he was afraid of getting it between the rolling seat. Luckily, after a few strokes, the hat fell into the cockpit behind the footstretcher. Thirty four strokes a minute, 500m into the race, the Masters were still leading, and just silently enjoying the view of the Juniors/Men, a length behind them. That other boat was not silent. One after the other, those guys were shouting calls. They were clearly surprised at not leading. 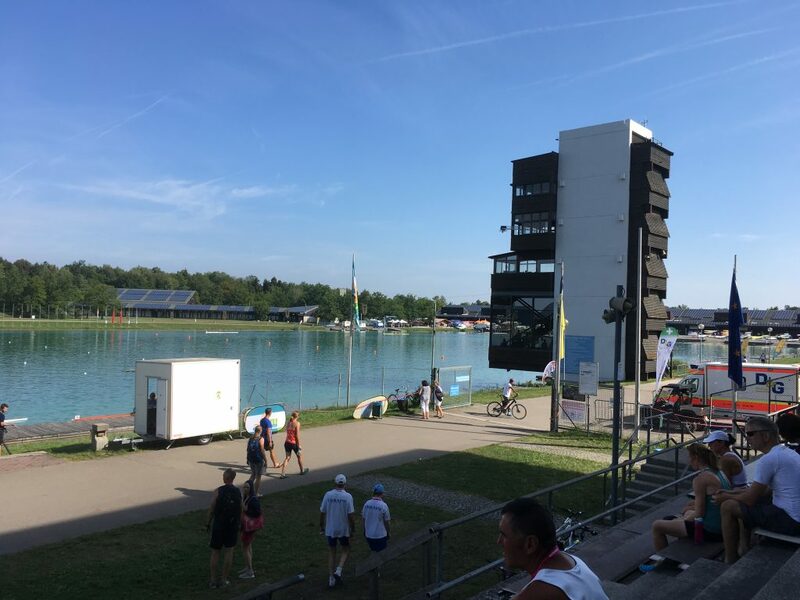 After about 1000m, the Masters eight passed the CVK Brno club house, in front of assembled wives and partners. Good to hear the cheers. A few strokes later, there was a huge wake coming from the left. From the Water Rescue Squad, who were being playful with their launch. The Masters got the full wake but kept rowing, but the Juniors were doing one more of their power tens while they didn’t have the wake, and rowed straight through the Masters. From that moment on, the Masters were trailing half a length, then a length. There was some good cheering at Kozi Horka (Little Goat Mountain) and the club house of Lodni Sporty Brno, and then it was counting strokes until the finish line. 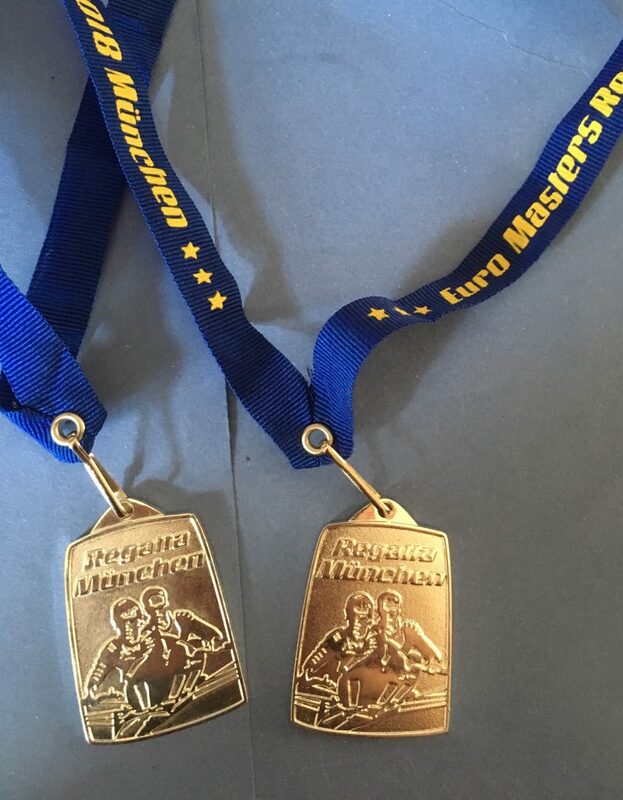 As expected, the men won, but the Masters won the 1k, and isn’t that the Masters’ distance? 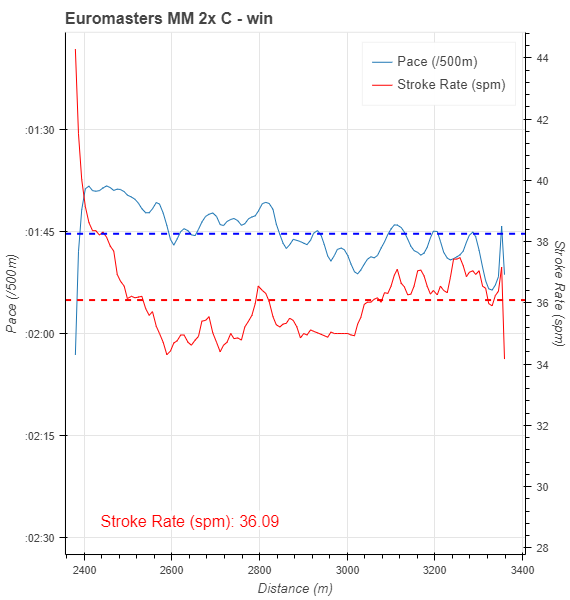 Well, look at the stroke rate. No wonder they faded at 1k. 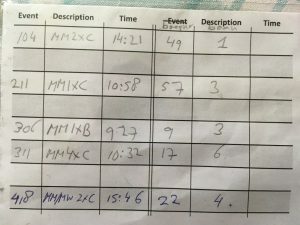 This row was recorded on a NK SpeedCoach GPS 2 coupled to a Polar OH1 optical heart rate meter, worn on two seat Masters rower’s upper left arm. This doesn’t limit the rowing at all. 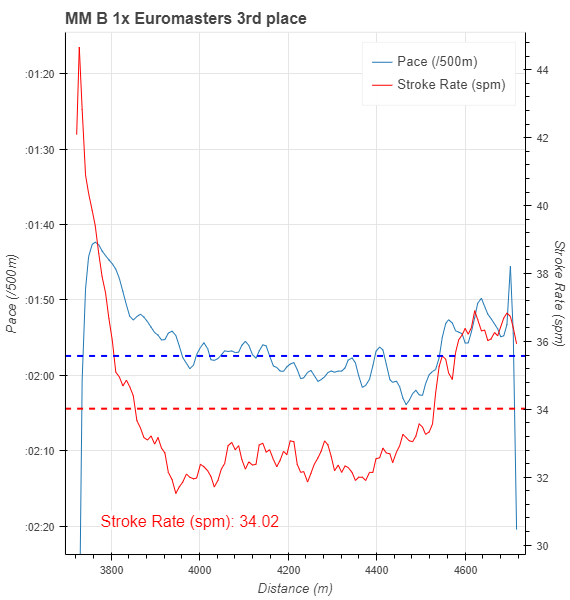 There were a lot of people wearing heart rate belts, and perhaps this confused the SpeedCoach, or there was something else wrong with the heart rate, because this Masters rower went well above 170bpm. 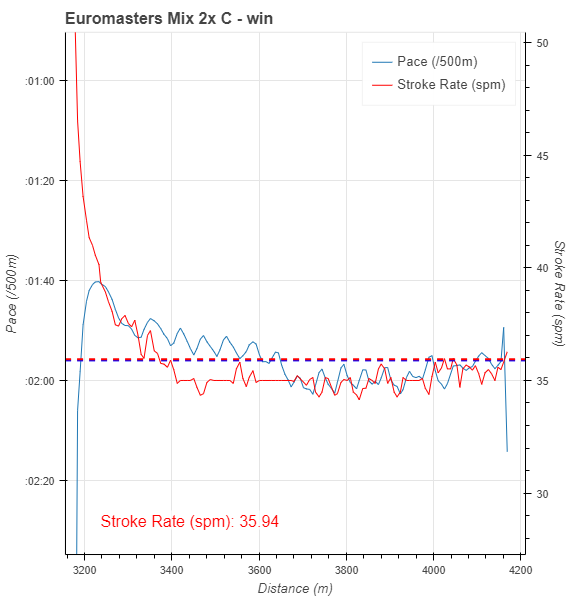 He knows how he felt during the race, and it certainly wasn’t 140 bpm. 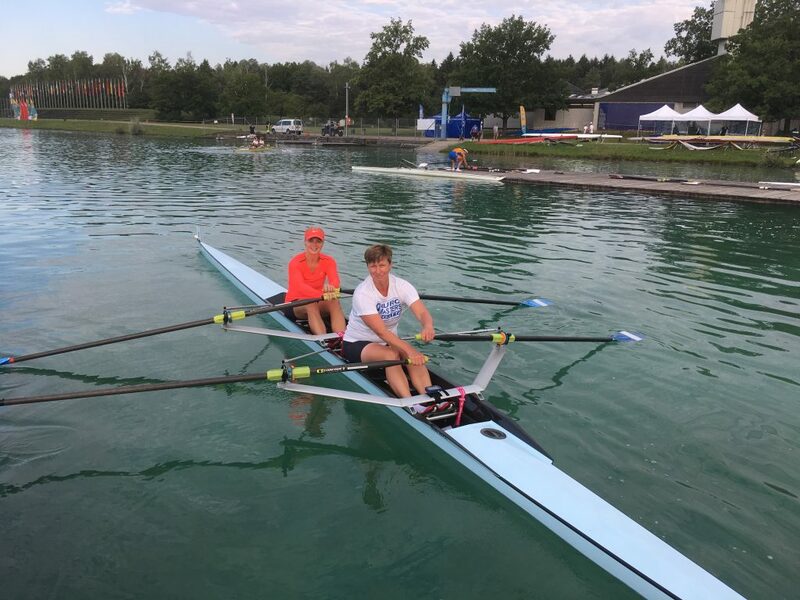 The row was recorded as a “Just Row”, because on Regattas, you don’t want to fiddle with the SpeedCoach right before the race start. 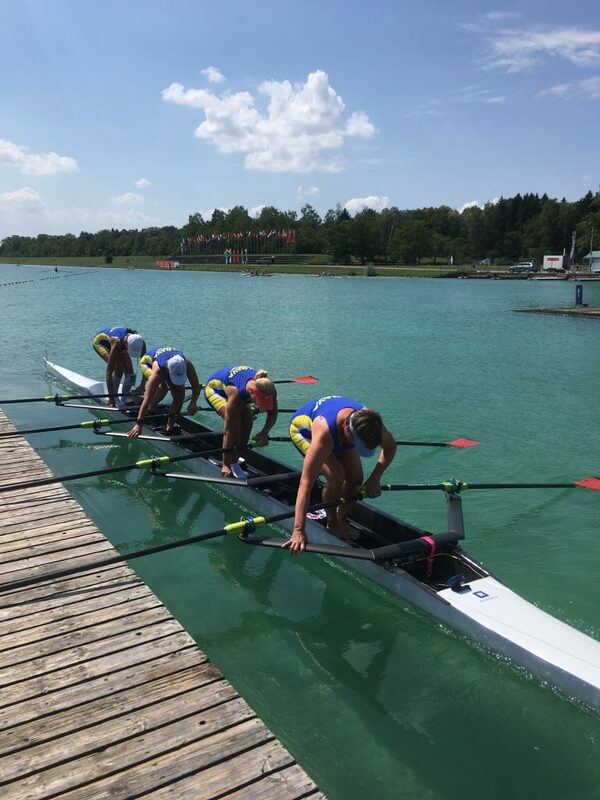 After the race, the SpeedCoach was paired with an iPhone and the row was downloaded using NK LiNK for iOS. 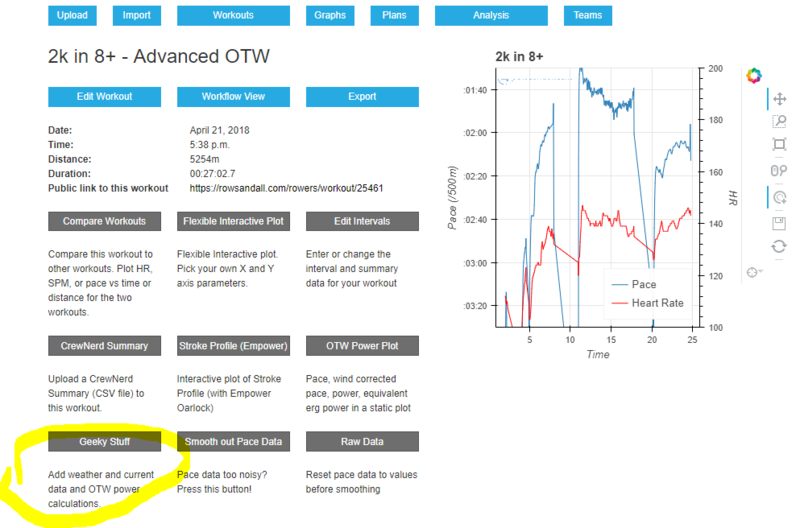 From the app, you can select the workout and send it as a CSV to workouts@rowsandall.com, which is exactly what happened just before the post-race shower. As the SpeedCoach didn’t record power data, the rower had to use one of the little tricks on rowsandall.com to get a power estimate. On the Advanced Workout page, there is a link to “Geeky Stuff”. 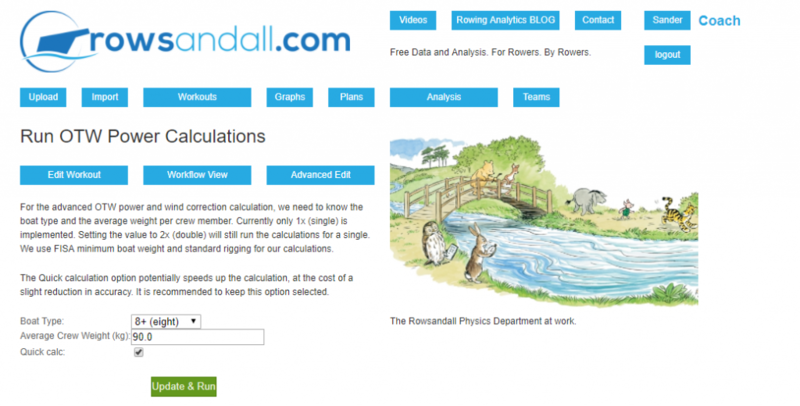 Clicking on that brings you to a page where you can Edit wind and stream data and start the OTW power calculations. 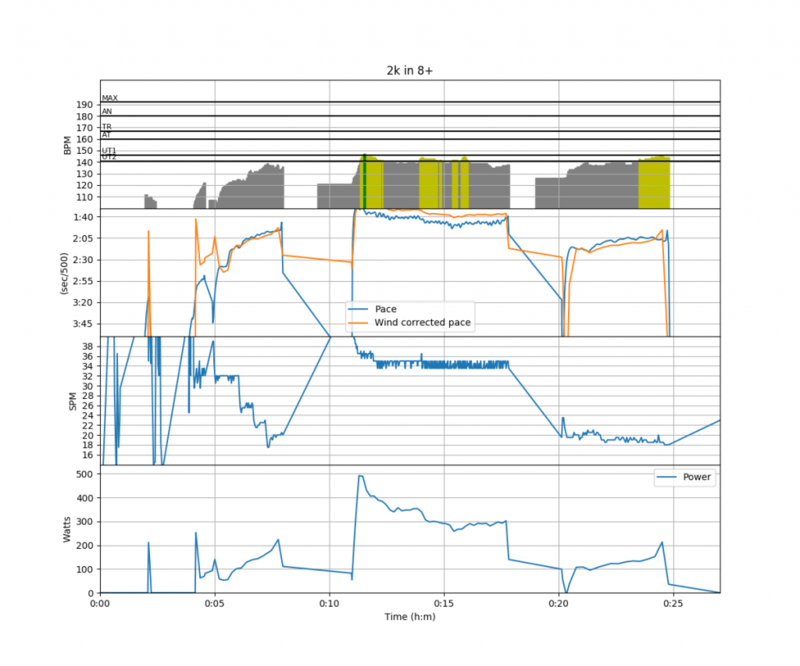 First, we need to add the wind, because the wind direction has a large influence on the power needed to achieve a certain boat speed. 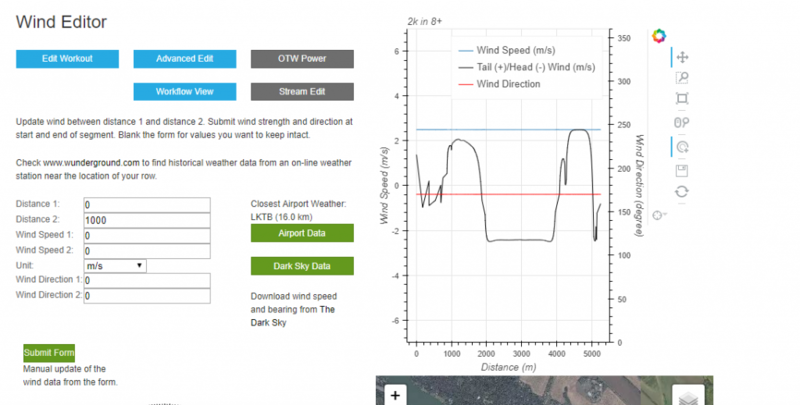 The easiest way to get wind data is to click on either “Airport Data” or “Dark Sky Data”. The wind is downloaded from these databases (either for the nearest airport or for the row’s coordinates from the Dark Sky database) and from the wind bearing and speed, a headwind/tailwind is estimated. After that is set, you can launch the OTW Power calculations. It is important to check the boat type and average crew weight, otherwise you get nonsense results. The Quick Calculation is a slightly faster calculation cutting a few corners. 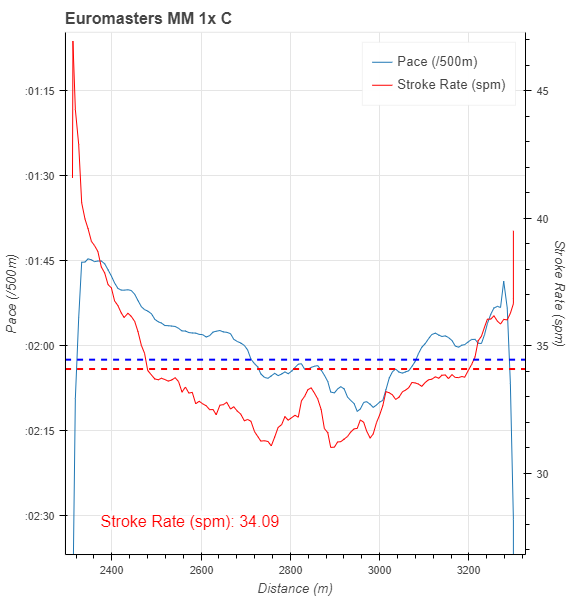 The site will launch a background process to estimate the power for each stroke, and it will send you an email when it is done. 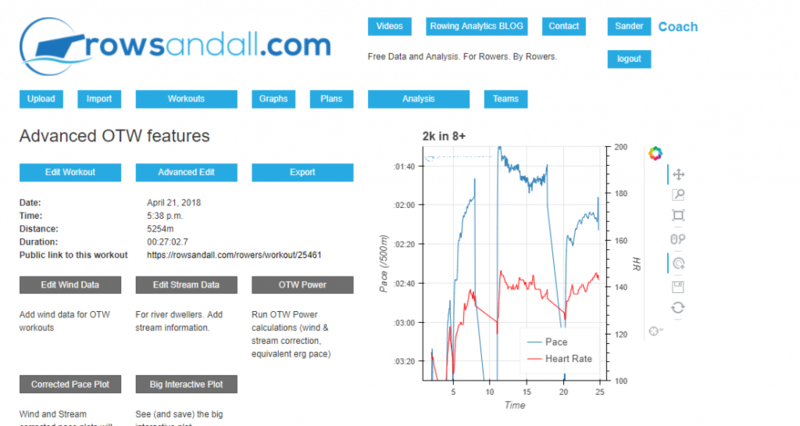 Then, you have power estimated values in your workout data. It is important to note that the estimate is the average power per rower for the eight. You may have pulled harder or less hard than the average. 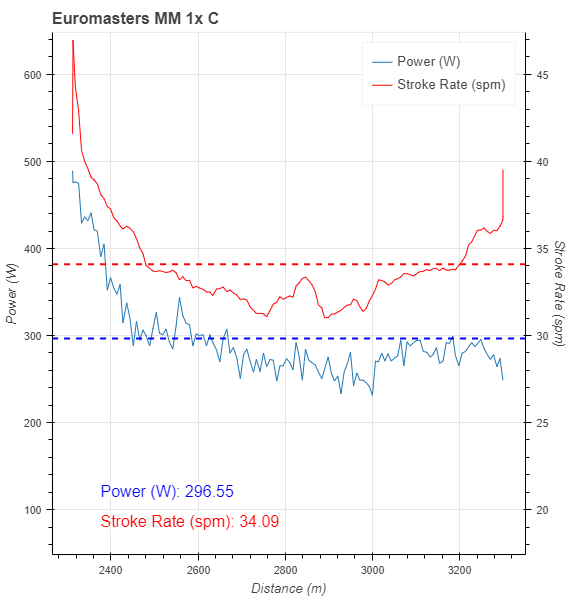 However, the power estimate is a good way to get at least some power value for rowers without power, and it is a way to see if rowing with power is something for you, before you spend the money to buy a power meter. 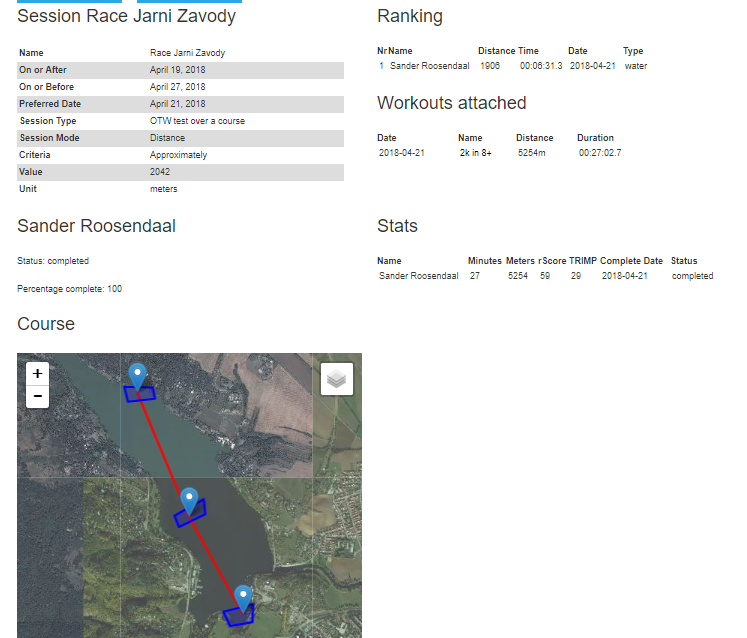 When this is done by an entire training group, the rowsandall.com page gives you a ranking per time.